Bus passengers could soon face lower fares and simpler ticketing rules thanks to a project being developed across the north. Cllr Don Stockton, cabinet member for environment, told members at Cheshire East Council cabinet meeting that “smart ticketing” is due to be rolled out on local buses over the next two years. A vital bus service linking Nantwich residents to Leighton Hospital has been saved from the axe. The 78 bus service was being cut by D&G Bus from July 22, a move which angered many users needing it to get to and from the hospital. The Nantwich Film Club is hosting the 3rd Nantwich Film Festival between May 19 and 27. This year’s “cinematic extravaganza” will be taking place at a variety of venues across the town. A 76-year-old woman fell victim to a distraction theft in Nantwich town centre, police have warned. The elderly victim was approached by a man and woman in the Home and Bargain store on Beam Street, who engaged her in conversation before leaving. Some evening bus services running in Crewe, Sandbach, Macclesfield, Middlewich and Congleton are being retained. All subsidised evening services in Cheshire East were due to be axed in a bid to save £1.5 million in costs. Hundreds of bus users in Nantwich and Crewe face five more days of travel problems as Arriva drivers continue strike action. The next day of industrial action takes place on Monday (November 6), with no Arriva bus services across South Cheshire, warns Arriva North West. Sunday and evening bus services in Crewe and Nantwich look set to be scrapped by Cheshire East Council after it reviewed its plans following consultation. But Saturday services will be maintained as the authority prepares to press ahead with cuts to its subsidised bus services. Hundreds of bus passengers across Crewe and Nantwich have been hit by the first of three planned industrial action days by Arriva North West drivers. 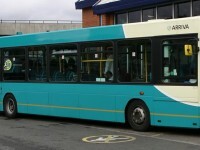 All Arriva North West services running in Crewe and Nantwich were cancelled today as part of the first 24-hour strike. A radical plan to axe all subsidised evening and Sunday bus services, is being considered by Cheshire East Council. The proposal, which will now go out for a 10-week consultation, is designed to save the authority more than £1.5 million. Elderly Shavington residents fear they have been ‘forgotten’ in the shake-up of public transport after the collapse of GHA Coaches. Almost all bus routes have been saved by Cheshire East Council – except the no 44 service which took Shavington residents to and from Crewe and Nantwich. Bus services in Nantwich and Crewe are almost back to normal two weeks after the collapse of one of Cheshire East’s biggest operators, GHA Coaches. The company ceased operating on July 13, leaving Cheshire East Council’s transport management company TSS to deal with a major challenge. Bus operators like D&G have stepped in to maintain services after GHA Coaches went in to administration. Public services across South Cheshire were thrown into chaos after the company announced it was ceasing all operations on July 13.